So I’ve been pretty open about the fact that I’ve moved from data warehousing in the television and online ad industries to data warehousing in the gaming industry. The problem domains are so incredibly different. In the television and ad industries, there’s a relatively small amount of data that people are actually concerned about. Generally speaking, those industries are most interested in how many people saw something (viewed the ad), how many people interacted with it (clicked on it), and whether they went on to perform some other action (like buying a product). However, in the gaming industry we’re interested in literally everything that a user does – and not in the creepy way. The primary goals are to monitor and improve user engagement, user enjoyment, and core business KPIs. There are a lot of specific points to focus on and try to gather this information, and right now the industry standard appears to be a highly generalized event/payload system. When looking at highly successful games like Temple Run (7M DAU [gamesbrief]) it’s only 150 events per user to get a billion events per day. Between user segmentation and calculating different metrics it’s pretty easy to see why you’d have to process parts of the data enough times that you’re processing trillions of events and hundreds of GB of facts per day. When I see something that looks that outrageous, I tend to ask myself whether that’s really the problem to be solving. The obvious answer is to gather less data but that’s exactly the opposite of what’s really needed. So is there a way that to get the needed answers without processing trillions of events per day? Yes I’d say that there is; but perhaps not with the highly generic uncorrelated event/payload system. Any move in that direction would be moving off into technically uncharted territory – though not wholly uncharted for me. I’ve built a similar system before in another industry, albeit with much simpler data. If you aren’t familiar at all with data warehousing, a ten thousand foot overview (slightly adapted for use in gaming) would look something like this. First, the gaming client determines what are interesting facts to collect about user behavior and game performance. Then it transmit JSON events back to a server for logging and processing. From there the data is generally batch processed and uploaded to a database* for viewing. So as a basic sanity check, I’m doing some load testing to determine whether it is feasible to gather and process much higher resolution information about a massively successful game and it’s users than seems to be currently available in the industry. Without going into proprietary details, I’ve manufactured analytics for a fake totalhelldeath game. It marries Temple Run’s peak performance with a complicated economy resembling Eve Online’s. I’ve traditionally worked in a small team on products that have been established for years. I have to admit that it’s a very different experience to be tasked with building literally everything from the ground up – from largely deciding what analytics points are reasonable to collect to building the system to extract and process it all. Furthermore, I don’t have years to put a perfect system into place, and I’m only one guy trying to one up the work of an entire industry. The speed that I can develop at is critical: so maintaining Agile practices [wikipedia], successful iterations [wikipedia], and even the language I choose to develop in is of critical importance. The primary motivator for my language choice was a combination of how quickly I can crank out high quality code and how well that code will perform. Thus, my earlier blog post [blog] on language performance played a pretty significant role in which languages saw a prototype. Python (and pypy specifically) seems well suited for the job and it’s the direction I’m moving forward with. For now I’m building the simplest thing that could possibly work and hoping that the Pypy JIT will alleviate any immediate performance shortfalls. And while I know that a JIT is basically a black box and you can’t guarantee performance, the problem space showed high suitability to JIT in the prototyping phase. I foresee absolutely no problems handling the analytics for a 1M DAU game with Python – certainly not at the data resolution the industry is currently collecting. But, I’m always on the look out for obvious performance bottlenecks. That’s why I noticed something peculiar when I was building out some sample data a couple of days ago. On the previous project I worked on, I found that gzipping the output files in memory before writing to disk actually provided a large performance benefit because it wrote 10x less data to disk. This shifted our application from being IO bound to being CPU bound and increased the throughput by several hundred percent. I expected this to be even more true in a system attempting to process ~365GB of JSON per day, so I was quite surprised to find that enabling in-memory gzip cut overall application performance in half. The implication here is that the application is already CPU bound. Use a different json library. Ideally it JITs better than built in and I can just keep going. Accept pypy’s slow json serialization as a cost of (much) faster aggregation. Just so that everything is immediately obvious: this was run on one core of an Amazon XL instance, and the charts are measuring facts serialized per second. That means that bigger bars are better here. 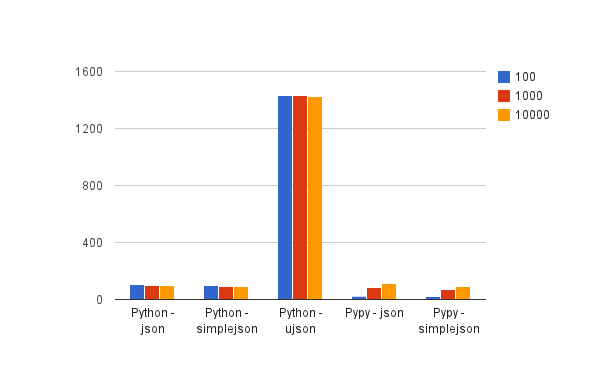 There’s really no obvious stand out winner here, but it’s obvious that the builtin json library is lacking in both cpython and pypy. It obviously runs a bit faster with cpython, but it’s not enough to really write home about. However, simplejson and ujson really show that their performance is worth it. In my not-so-expert opinion, I’d say that ujson walks away with a slight victory here. However, here there is an obvious standout winner. And in fact, the margin of victory is so large that I feel I’d be remiss if I didn’t say I checked file sizes to ensure it was actually serializing what I thought it was! There was a smallish file size difference (~8%), primarily coming from the fact that ujson serializes compact by default. So now I’m left with a conundrum: ujson performance is mighty swell, and that can directly translate to dollars saved. In this totalhelldeath situation, I could be sacrificing as much as 71k + 44k extra core-seconds per day by choosing Pypy over CPython. In relative money terms, that means it effectively increases the cost of an Amazon XL instance by a third. In absolute terms, it costs somewhere between $5.50 USD/day and $16 USD/day – depending on whether or not it’s necessary to spin up an extra instance or not. Obviously food for thought. Obviously this load test isn’t going to finish by itself, so I’m putting Python’s (lack of) JSON performance behind me. 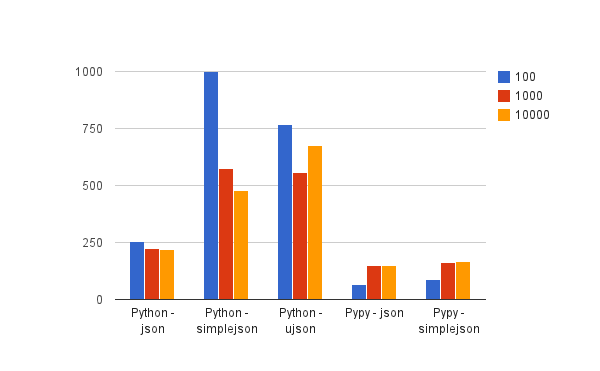 But the stand out performance from ujson’s write speed does mean that I’m going to be paying a lot closer attention to whether or not I should be pushing towards CPython, Cython, and Numpy instead of Pypy. 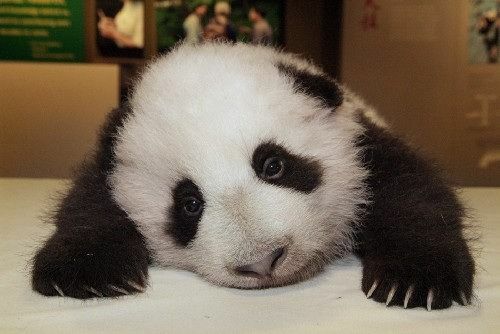 In the end I may have no choice but to ditch Pypy altogether – something that would make me a sad panda indeed.